Qouta Seats - Ayub Medical College, Abbottabad. FATA seats include all seats reserved in Medical and Dental Colleges of Khyber Pakhtunkhwa and other Provinces. Out of the total reserved seats for FATA. Ninety percent seats will be shared between the candidates who have passed SSC (Science), FSc (Pre-medical) from Institutions located bother inside and outside FATA. Any candidate who has obtained part of his/her education outside FATA, will not be considered as inside candidate. In case of non existence of school/college or non availability of the facility for teaching science subjects, the candidate will have to provide a solid proof in the form of a certificate (as per specimen given on page 71) duly versified by the concerned DEO (Education) and countersigned by the concerned PA (Agencies) and DC (FRs). In case a candidate nominated against FATA reserved seat does not avail the facility for which he has been nominated; the Nominating Agency should be informed by him/her immediately, failing which a penalty of debarring for one/two years will be imposed on the defaulter candidate(s) for his/her future selection/nomination against reserved seats. The candidates applying against FATA reserved seats in Khyber Pakhtunkhwa Medical and Dental Colleges as well as elsewhere in Pakistan shall apply to the Chairman JAC on prescribed forms as well as submit a photocopy of admission form along with attached documents in the FATA Secretariat, Khyber Pakhtunkhwa, Peshawar whose concerned authorities will verify the documents especially the domicile. Possess valid FATA domicile certificate. His/Her father must possess a valid domicile of FATA. In case father of the candidate is not alive then the mother’s valid domicile of FATA will be considered. Have appeared the Entrance test for admission to Khyber Pakhtunkhwa Medical & Dental Colleges. Fulfill all other criteria laid down for admission in Khyber Pakhtunkhwa Medical & Dental Colleges. The seats have been created under the project titled Provision of Higher Education Opportunities for Balochistan & FATA. The Candidates applying against FATA/Balochistan Project seats reserved in Khyber Pakhtunkhwa Medical and Dental Colleges, shall directly apply to Higher Education Commission on the prescribed form. The HEC shall finalize the list of candidates to be admitted as per Policy formulated for the said project. Nomination of candidates shall be sent by HEC, Islamabad to the concerned colleges through Secretary Health, Government of Khyber Pakhtunkhwa. III. Seats reserved for AJK & GILGIT Baltistan (Northern Areas). 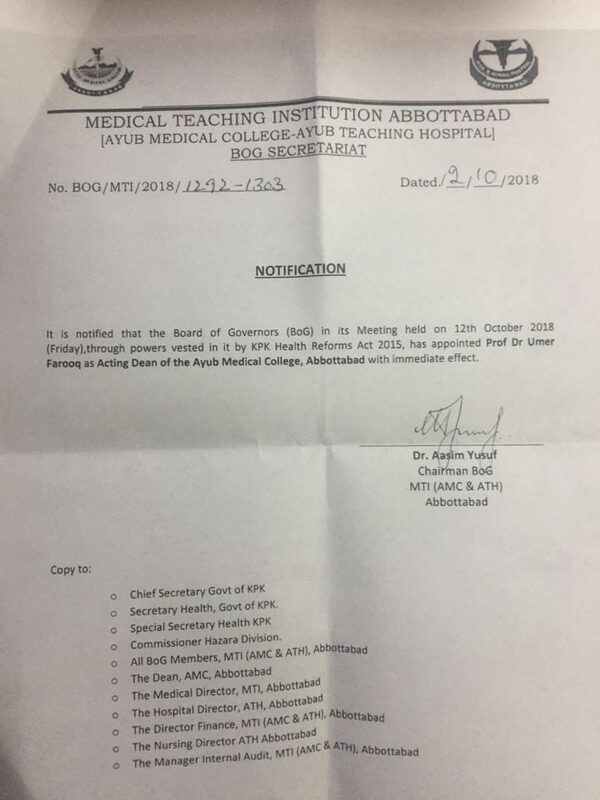 The AJK & Gilgit Baltistan (Northern Areas) seats include all seats reserved in Medical and Dental Colleges of Khyber Pakhtunkhwa for candidates from AJK & Gigit Baltistan (Northern Areas). The candidates seeking admission from AJK & Gigit Baltistan (Northern Areas) against the seats reserved in Khyber Pakhtunkhwa Medical/Dental Colleges should apply to Secretary Nomination Board Muzaffarabad and Director of Education Gilgit Baltistan (Northern Areas) respectively. The candidates and his/her father shall possess Gilgit Baltistan (Northern Areas) valid domicile certificate/AJK valid state subject certificate/domicile certificate. In case father of the candidate is not alive then the mother shall possess Gilgit Baltistan (Northern Areas) valid domicile certificate/AJK valid state subject certificate/domicile certificate. The nominated candidates must have appeared in the Entrance Test conducted by the Government of Khyber Pakhtunkhwa for admission for the current session and have obtained at least 60% unadjusted marks in their F.Sc. (Pre-Medical) or equivalent examination. The selected candidates of AJK/Gilgit Baltistan (Northern Areas) must report to the Principal of the concerned Medical/Dental Colleges of Khyber Pakhtunkhwa before the closing date of admission.